Rio’s carnival is world-famous and it’s a bucket list experience for many. You’ll be visiting the city at the most exciting time of the year. It’s guaranteed to be a sensory overload. To recover, we’ll be sending you to the idyllic town of Paratay. You’ll explore its colonial architecture and sail around its surrounding islands. When you arrive at the airport your driver will meet you and take you to your hotel. In the build-up to the carnival the atmosphere will be electric. Wander around the city at your own pace. Stroll along the Copacabana beach and have lunch in Imapnema. This morning you’ll meet your tour guide and get acquainted with the cities’ main attractions. 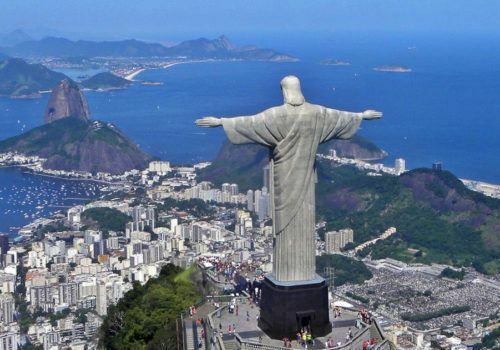 You’ll visit the famous Statue of Christ The Redeemer on Corcovado Mountain and stand right before it – this will be a great Instagram moment. You’ll also take a trip to Sugar Loaf and visit the Museum Of Modern Art. You may also wish to visit the gay nightlife at Rua Farme de Amaedo. It’s Carnival day, hopefully you won’t be too hungover. Relax in the morning and prepare yourself for the festivities. You’ll be heading to Sambadrome which built exclusively for the parades. Prepare yourself for some serious sensory overload. There’ll be plenty of nightlife to explore and the gay scene will be particularly lively. We can also arrange tickets for pool parties, drag shows or many of the other after parties taking place. Today you’ll be recovering from the carnival. You may wish to order an emergency bloody mary at the hotel and then unwind on the beach. This morning you’ll be flying to the town of Paratay on the Costa Verde. This small, idyllic town is one of Brazil’s hidden gems. Paratay established itself by trading gold and later, sugar cane. You’ll be embarking on a guided tour of this colonial town. Your guide will show you around its historic centre and then you’ll head to Casa da Cultura. Here you’ll learn about Paratay’s past. Much of the architecture in Paratay was built by the Portuguese in the 18th-century as they colonised the country, thereby turning it into Brazil as we know it today. This morning you’ll be setting out on a boat tour of Ilha Grande Bay, where you’ll find many uninhabited islands. Back on dry land you’ll be able to smell the local sugarcane plantations. A rich caipirinha will go down well as you’ll be drinking it close to its origins. You’ll also visit a rum distillery and sample some of Brazil’s finest. You’ll be free to relax on your last day. Perhaps a spot of shopping and drink on the beach will be in order. You’ll be transferred back to Rio for your return flight.